The marinade for this comes from Ohio-based Organic Valley farmer Charlene Stoller. Charlene says it will work for any meat, not just pork chops. We like how it uses ingredients that are typically on hand in the kitchen—which means you can make dinner without having to take a trip to the store. 1. Mix vinegar, Worcestershire sauce and seasonings in a bowl or shallow dish that’s just large enough to hold the chops. Whisk in the olive oil a little at time. Stir in the onions. Add the chops to the marinade and turn to coat them thoroughly. Cover, refrigerate and let the meat marinate 4–8 hours. If possible, turn the chops several times during the time they marinate. 2. Prepare an outdoor grill (if using charcoal, heat the briquettes until glowing). Remove chops from the marinade and dry them well on paper towels. Brush the grill rack with a little oil, and place meat on it. 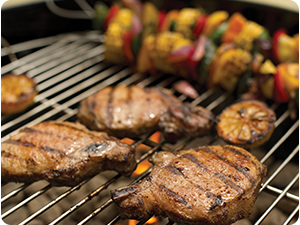 Grill 4 inches over the heat until chops are just cooked through, about 5–7 minutes per side. Baste them with some of the marinade during the last 5 minutes of cooking time. 3. 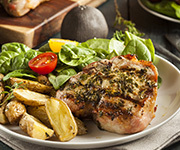 Let pork chops stand 5 minutes before serving, to let the juices settle throughout the meat.